PHUKET: -- A man masked by a motorbike helmet robbed a Family Mart store in Chalong at gunpoint early this morning, making off with more than 19,000 baht in less than a minute. 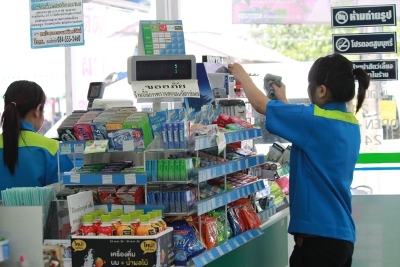 Phuket Police believe the man is responsible for at least two other gunpoint robberies of 24-hour convenience stores carried out in the past week, one in Patong and another in Nai Yang. Rapeeporn Tangeng, supervisor of the Family Mart store near the entrance to Soi Yodsanae, which leads up to the Big Buddha image, told the Phuket Gazette that the man entered the store at about 4am. “The man entered the shop wearing a helmet, black jacket and gloves came. He pointed the gun at a staff member and told her in Central Thai [dialect] to get out from behind the counter. She screamed in panic and moved out of the way,” Ms Rapeeporn said. Another female staff member who was at the back of the shop heard the scream and sneaked out into the shop. “She hid behind an aisle of products while watching the robber. He jumped over the counter right away and opened the unlocked safe underneath, then took off with the basket that was inside the safe, which had about 19,000 baht in it,” Ms Rapeeporn said. “He took less than one minute to away,” she added. The two CCTV cameras inside the store show the robber was a thick-set man about 170 centimeters tall. “Chalong Police said he looked like the same man who robbed the Family Mart on Phisit Gorani Road in Patong less than a week ago,” Ms Rapeeporn said. Police said they also suspect the same man robbed a 7-Eleven store in Soi Na Ya, in Nai Yang, three days ago, she added. “Our shop is insured, but we are increasing our security measures,” Ms Rapeeporn said. “To start with, we will not be leaving the safe key in the drawer anymore, and we will have at least one male staffer working on the night shift,” she said. "He jumped over the counter right away and opened the unlocked safe"
Is your ATM pin number written on the back of your key card?